Hoo-ray and up she rises, etc. I. Sailors often sang sea-shanties when they were working on the ship. In this song, when they say: 'Hoo-ray, and up she rises’, they are talking about the big heavy anchor which they are pulling up from the bottom of the sea. 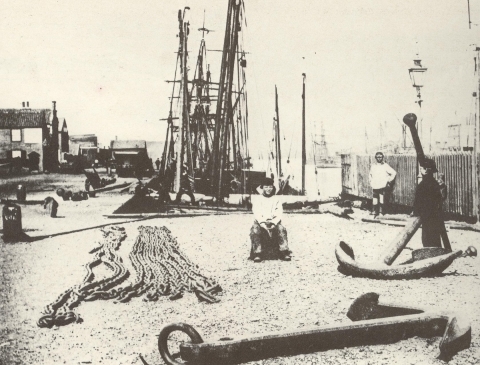 Chanties, sometímes spelt shanties, are songs with a strong rhythm sung by groups of workmen to accompany their work. Some are sung by mìners as they swing their picks against the rock-face, others by lumbermen hauling tree trunks, others by chain gangs working on the roads or the railway. The best known are the sea-chanties. These used to be sung on sailing ships to help the sailors haul the anchor chain round the capstan, or pull the ropes that controlled the sails. Since most of the jobs are now done by machines, chanties have joined the ranks of folk songs. However sea-chanties have found their way into the Opera House through the work of the contemporary English composer, Benjamin Britten.